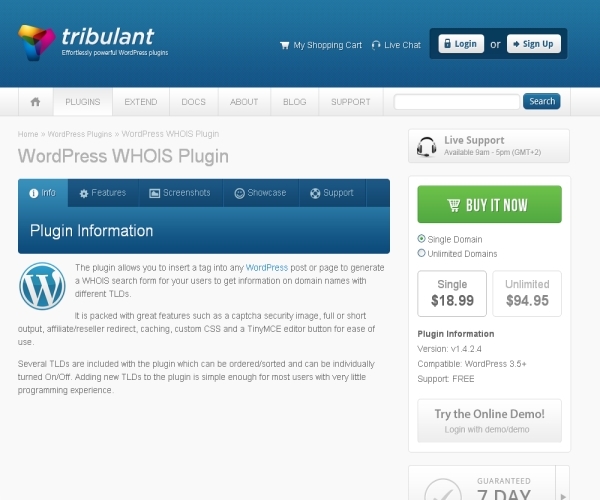 The WordPress WHOIS plug-in from Tribulant.com gives your users an ability to use a built-in WHOIS search form within your site. You can include the plug-in in any location and can have users get contact and registrant/registrar information on domain names with different extensions. You can also easily add a new TLD or an extension to the list of TLD’s. The Plug-in works with WordPress 3.3 and higher and is cross browser compatible. The Ajax based search form allows users to search for a domain and fetch the result while being in the same page. To filter out spam and automated submissions you can also include a Captcha image or a human equation. The plug-in is also customizable and allows you to change the graphic elements as per your requirement. The list of TLD’S (Extensions) can also be sorted as per prominence. The WordPress WHOIS plugin comes with included documentation and video tutorials. You can also submit a trouble ticket and can also have access to a dedicated support forum . It can be inserted as a sidebar widget and suits sites related to domain registration, hosting, online advertising etc. Price: The WHOIS plug-in from Tribulant is priced at $18.99 for a single domain and $94.95 for use in unlimited domains.